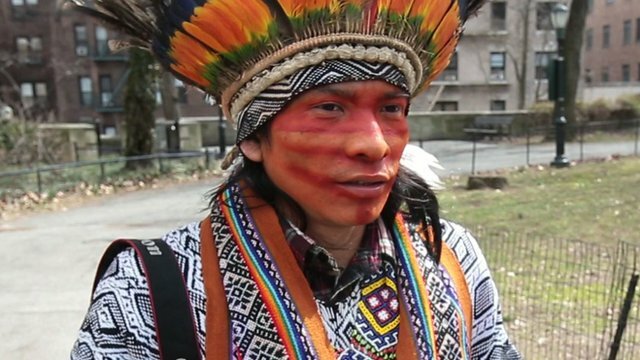 Nilson Tuwe Huni Kui is the 29 year old son of a traditional Amazon chief in Brazil. After attending a summit in Rio De Janeiro, Tuwe was offered a fellowship to study in New York city through Tribal Link’s Indigenous Fellowship Program and the Nataasha van Kampen Foundation. After arriving to New York, Tuwe said it was a major culture shock in comparison to his traditional village describing his experience flying to the USA on an airplane, “only after awhile your soul gets there. Because the plane is very fast but the soul takes longer to arrive.” In a city like New York, everything is accessible and public transportation makes everything possible to get to for any NYC resident or tourist, but in Tuwe’s viallage, the same is not true. It takes 5 hours to travel to the nearest city and the village is comprised of only 600 people. Tuwe explains that he is the son of the traditional chief of the Huni Kiu Kaxinawa tribes in Brazil and that his father is the equivalent of our president Obama. As the chief’s son, Tuwe has been trained as a youth leader who will be a communicator and his intention for coming to the US was to create connections and develop resources to help his tribe. Though travelling from a faraway tribal village which exists in voluntary isolation, Tuwe says he loves and appreciates technology because it allows for him to learn about other people in the world and for other people throughout the world to learn about his people. His adventures in the concrete jungle are not simply for exploration and adventure though, Tuwe says he intends to learn English and establish support for this people who face major problems caused by illegal logging and noarcotraffic. He is producing a documentary film about his people called “Us and Them” which he hopes will help to express the story of his people and create opportunities to support issues within his tribe. Tuwe notes the major differences apparent between the two world in everything from people to food and says that his people have a different idea of what ‘rich’ means than we do, explaining that his people are rich in biodiversity, spirituality, and culture.